So on first glance the brushes of both mascaras are really similar the W7 is just slightly smaller than The Benefit. So I wore the W7 mascara for a few days and was really impressed with it, It is a great mascara and at only €3.50 you really couldnt go wrong but I wanted to test it directly against the Benefit They're Real so I figured the only way I could achieve this was to wear each mascara at the same time and It was with this thought that I ended up wearing W7 Absolute lashes on one eye and Benefit Theyre real on the other eye for a number of days. This really allowed me to compare them in every way. This side (left) is the W7 Absolute lashes and right is Benefit Theyre Real. Do you see a difference? This pic is each mascara applied onto my lashes with no curlers used etc. The W7 is slightly more effort to apply as It does need a few brushes through to get the desired look but definitely nothing that would put you off. They both look exactly the same on which you can see from the pic. Whats even better is they both lasted the same amount of time with the plus that the W7 was easier to remove! I have never found a duplicate that is this close to the higher end product. I mean there really isnt any difference well except if you count the huge €22.50 price difference. 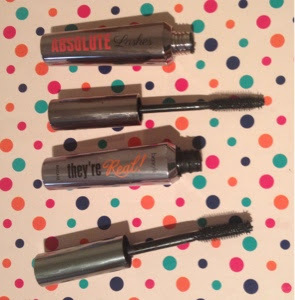 This W7 Absolute Lashes will definitely be the one that will be in my makeup bag in the future I cant believe that I can get all of this quality that really delivers for only €3.50! !